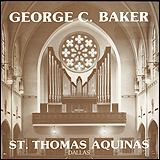 Lists of recordings with George Baker as organist, producer and editor, and other recordings featuring George Baker. Recordings are available from the Organ Historical Society, Solstice Music, and Spinning Dog Records. A Tribute to Pierre Cochereau with George C. Baker, David Briggs, Thierry Escaich, and Loïc Mallié. George Baker plays his compositions Ricercar on "Nun komm, der Heiden Heiland", Berceuse-Paraphrase, and Toccata-Gigue on the Sussex Carol. 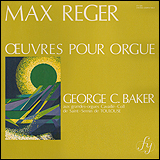 World premiere recording with Pierre Cochereau and George C. Baker, organists. Awards: 1995 Nouvelle Académie du Disque Français Grand Prix Spécial du Jury, 2000 American Record Guide Critic’s Choice Award. Released in 1994. 8 volumes. CD Box Set. 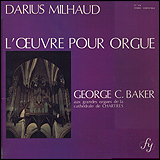 Disc features both Pierre Cochereau and George Baker, organists. 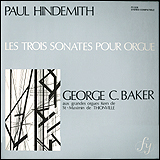 Baker plays Prélude en fa Diese Minuer (c. 1914), Improvisations (1929) et Transcrites par Maurice Duruflé, and Marche Triomphale op. 46. 24 Pièces en Style Libre op. 31, Prélude Funèbre op. 4, Messe Basse op. 30, Messe Basse Pour le Défunts op. 62. Recorded in 1993. 2 CDs. 24 Pièces de Fantaisie op. 51, 53, 54, & 55. Recorded in 1994. 2 CDs. 1 CD, remastered from 1976 analog recording. 1 CD, remastered from 1979 analog recording. Vision op. 44, Zephyrs, Deuxième Symphonie op. 26, Six Antiennes pour le Temps de Noël op. 48, Chorales op. 28 (Nos. 21-23, 36-41 & 66). 1 CD, remastered from analog recordings. 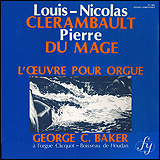 Louis-Nicolas Clérambault: 2 Suites. Pierre du Mage: Livre d'Orgue. Charles-Marie Widor: Toccata en Fa 9ème Symphonie "Gothique". Louis Vierne: 13 Pièces en Style Libre op. 31. Released in 1990. 1 CD. 1 CD, remastered from 1974 analog recording. J. S. Bach: Concerti in A Minor, D Minor, and G; Trio Sonatas Nos. 1 and 6. Scott Joplin: The Entertainer and Maple Leaf Rag. 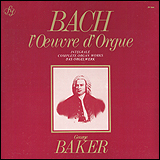 The first recording of Bach's complete organ works by an American. Recorded 1976, 1978, and 1979. Released 1979. 19 LPs Box Set. 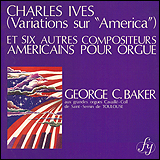 Works of Charles Tournemire, Nicolas de Grigny, Jean Langlais, César Franck, Louis Vierne, and Fred Coulter. Organist Philippe Lefèbvre, who is titular organist at Notre-Dame Cathedral, and Paris Conservatoire improvisation professor, presents specific techniques and gives examples in the art of improvisation in the French style. Anyone wishing to improvise, from beginners to advanced practitioners, will find many helpful and practical tips in this unique film. A bonus feature at the end of the film is an improvisation by Philippe at Notre-Dame, which demonstrates many of the colors of the organ, from the celestes to the tutti. The music is accompanied by a slide show of the Cathedral and its magnificent organ. Filmed 2010. Released 2011. 1 DVD, NTSC (PAL Available), Multizones. Recorded 2002. Released 2003. 1 CD. Recorded 2003. Released 2004. 1 CD. Released on the occasion of the 20th anniversary of Pierre Cochereau's death and in homage to the exceptional artist he was, this DVD is primarily made up of official archives and private documents. It is interspersed with interviews of other musicians, former students, personalities, and close friends. Released 2004. 1 DVD, NTSC, Multizones.